M3rNi3: Bday Dinner, Concert and "Goodie Bag"
It is my sister in law's birthday today. Actually I totally forgot about it. How could I?? My initial plan was to bring my kids and hers to Downtown East to just while our time and perhaps eat at MacDonalds. When I called sil's kids up, they said "Today is mummy's bday and we have a concert for her with a break in between ...." At that point, in my heart, I went "Danget! I forgot again"
So after my hubby and I fetched our kids, we fetched our nieces and head down to the airport instead to meet their daddy and mummy. We had dinner at Swensen's (oops! I forgot to snap pix of our dinner). 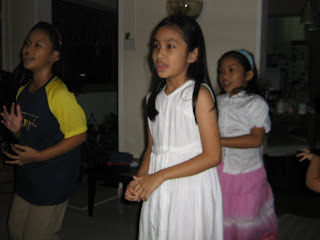 After dinner, we head down to sil's house and watched the kids perform their concert. They are such talented kids and aint they sweet, they really practiced hard to perform for their dearest mummy. They emceed, did cheerleading, modelled, played the piano, sang and danced for the person whom they appreciate most, "Your Highness Lily"! 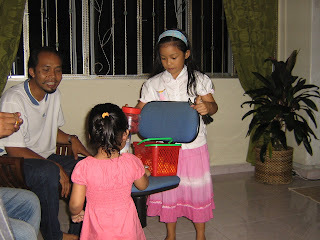 Here are pix of her kids, Adriana and Aida and also Nadia, a girl whom sil is babysitting performing their last number. Thats Aida, providing "light refreshments" to "concert-goers" during the break. We truly truly enjoyed ourselves tremendously. My family didnt go home empty handed. 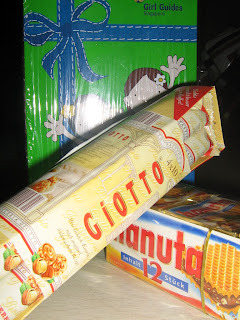 We brought home a bag of German goodness - Hanuta and Giotto that Budi brought back from Germany and also a tin of Girl Guide's choc coated peppermint cookies. To sil, Lily - Happy happy birthday to you! Hope I didnt ruin your initial birthday plan!